The traditional approach to budgeting is to create a custom spreadsheet. Over time, continual adjustments to variable data make these spreadsheets unsustainable and often, with personnel changes, the process is started from scratch. This manual approach is costly, time consuming and prone to errors. If you can relate to this frustrating process, it’s time for a paradigm shift – think beyond spreadsheets for an automated budgeting process. Scenario modeling based on key performance indicators and statistical accounts like head count, square footage, etc. Frustrated because the minute you finalize your budget it is out-of-date? For most companies, accurate forecasts are a luxury they don’t have the time and resources for. Yet, the ability to re-forecast quickly can mean significant competitive advantage. With Dynac Rolling Forecasts, users can dynamically re-forecast based on any number of actual periods. For example, 3 months actual dynamically linked to 9 months forecast shows you where you thought you would be AND where you might be based on changing business conditions. Dynac Rolling Forecasts can easily be extended beyond 12 periods for a long-term view. Automated budgets and forecasts – better tools for you! Make the arduous annual budget process a thing of the past. Your most recent Rolling Forecast can be calibrated with historical run rates to make next year’s Annual Budget a snap. 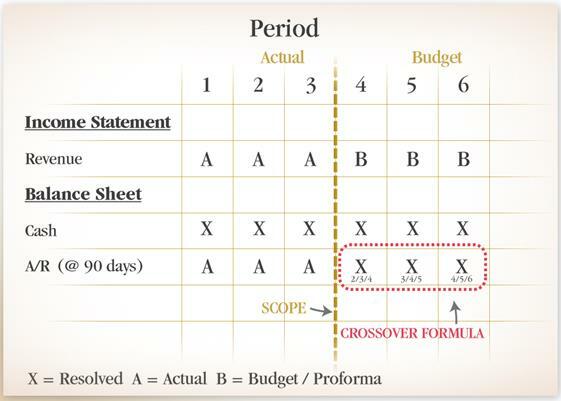 Dynac features a unique set of Definitions which deploy “crossover formulae” – as many forecasted values have a dependence on prior period Actuals or Budget amounts. See the example below, where 90 days Accounts Receivable returns a dynamic value based on a combination of Actual and Forecast. In essence, your closing actual balance becomes your open balance for your forecast and you dynamically model the remaining months. Just imaging this power at your fingertips! Reports can be quickly and easily created to compare Income Statement, Balance Sheet and Cash Flow for multiple periods for Budgets vs. Forecast complete with variance analysis.